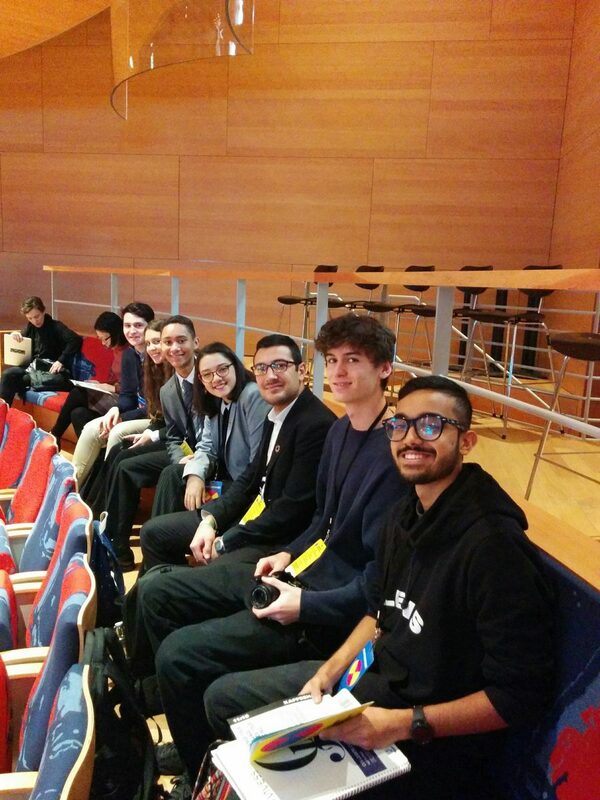 On Monday, November 12th, I headed from Pankow to Pierre Boulez Saal at the Barenboim-Said Akademie with my classmates from the Global Citizenship course to attend a workshop organized by the Institute for Canadian Citizenship with a prominent guest list. I had skimmed through the programme a couple of days before and saw that participants included people like Giorgos Kaminis, the mayor of Athens, and Bernhard Schlink, award-winning author of The Reader — a book I read back in my junior year of high school addressing the struggle of the post-war German generation in comprehending how their parents and grandparents could have committed the atrocities of WWII. I woke up at 6:30 AM very excited but without any concrete expectations for the event ahead. The conference was designed as a conversation about resolving the massive challenges we are facing in this era of movement and displacement of people across the globe, highlighting our responsibilities to help counteract the emerging problems of marginalization, dehumanization and exclusion that come with forced migration. Sitting on a round, bright pink and blue platform in the center of a circular room, the guest speakers shared their expertise and discussed with each other as the audience watched and engaged with them from the outer circle. I kept linking what was said by the speakers back to the articles, novels, and essay excerpts that professor Kerry Bystrom had assigned our class. The discussion brought me back to the very beginning of the course when we questioned even the title of the class itself: What is “global citizenship” and what does it mean to be a “global citizen”? My definition was awareness of and cooperation in political and social developments on a local and global scale — and, coincidentally, that was what 6 Degrees was all about. For the first seminar 360: Where We Stand, we all sat packed like sardines together on the last row, still a little shy and formulating smart sentences in our heads since we knew one of us would be picked to speak by Scott Young, director of Ideas & Insights at the Institute for Canadian Citizenship, or Abdul-Rehman Malik (AR), journalist, educator and organizer. (Also, these are two of the coolest guys I’ve ever met; they told us everything we needed to know about 6 Degrees). But as soon as the round of introductions started, we loosened up. Bard College Berlin was heavily represented, but we also got to know a group of young women of four different nationalities who created the Berlin-based magazine Encounter in which they publish about the importance of dialogue and exchange in German, French, Arabic and Farsi. We also met a woman who was originally from Ecuador and who is currently constructing a museum there. They all looked for inspiration from the event. We were surrounded by truly amazing people, not only from all sorts of backgrounds, cultures and ages, but with various passions, professions and purposes. The grounds of the conference were set by John Ralston Saul, award-winning essayist, novelist, and co-chair of the Institute for Canadian Citizenship, who got straight to the point by saying that diversity is a fact and we must give inclusion a chance. This statement could be considered the 6 Degrees’ slogan — not in the radical and violent sense of “integration” asking migrants to find their place in an already existing hegemony by being “less immigrant”, but in the sense of opening up and finding there is something fundamentally wrong but remediable with society as a whole and its mechanisms and not with the people it has been rejecting. Guest speaker Dany Laferrière, Haitian-born novelist and screenwriter, commented on how people many times wrongly refer to the concept of refugees being first or second generation refugees as if one’s life starts again after migrating. The life of a refugee starts when they are born and continues when he or she is forced to move elsewhere: it doesn’t stop and begin again. The next discussion, Art and Protest, had no one less than Ai Weiwei as a speaker. Whoever knows me well knows I’m a huge fan of his work, and it was a remarkable experience to listen to him talk about his past as an artist who’s been through so much trauma and grief, including being arrested and exiled from China for his political activism. The main claims made during this round were mostly related to Weiwei’s story battling censorship and advocating for the right to freedom of speech through his art. What stuck with me the most was that when asked why, after what his own country has done to him, he still considers Beijing his home, Ai Weiwei responded that he proudly identifies himself as Chinese because of his people and his land and not his nation’s government. The afternoon discussion, 360: Where We Go, referred back to our morning seminar and raised not only many further questions of identity and perception but also uncovered a lack of answers to those questions. I remember one of the first people to share something was Sushan from our class: he started comparing dumplings to döners. Yes, all of us, including host Charlie Foran, CEO of the Institute for Canadian Citizenship, took an extra second to realize that we hadn’t heard him wrong, which could easily have been the case as we had just returned from lunch. Now, what do dumplings and döners have in common, and what do they have to do with immigration? Sushan explained that while both are nowadays considered Nepali and German dishes respectively, both were brought to Nepal and Germany by immigrants. Indeed, the döner was “Germanized” to Germans’ preferences, but it was originally a Turkish dish. This connects to the argument made by Amer Al Qadi, Palestinian entrepreneur guide at SINGA Business Lab, which was that migration is regarded as a threat to security and easily associated with terrorism rather than viewed as an opportunity. It is unfair to ignore the many benefits that immigrants bring to the table (literally and metaphorically). However, treating people as transactional in a way also isn’t the correct approach. By this I mean that solely accepting migrants into a society because of the economic, cultural, or culinary prosperity they may bring is not an adequate reason as it neglects their intrinsic value as human beings. Al Qadi then also mentions that there’s a racial factor that can’t be forgotten: A white refugee who arrives in a predominantly white foreign territory will most certainly not be treated the same way as an Arab refugee. Naika Foroutan, director of the German Center for Integration and Migration Research, stated that recognizing Germany as a country of immigration is easy, but making immigrants feel part of German society is much more difficult. Even with official criteria fulfilled, like having no criminal records and renouncing any previous citizenships, one is still not considered a “proper” German citizen by the German population. After all, “to really be German, your skin color should be white. It is imperative that you are able to speak the language. Most importantly, you should be able to speak the language fluently.” And so on, and so forth… The way I perceive it, it almost seems as if the unofficial requirements matter more than the official ones. Another problem that came from the crowd was the distancing of ‘us’ and ‘them’ when referring to immigrants. But who is ‘us’ and who is ‘them’? Who’s who? It is impossible to properly “integrate” people when such rhetoric of dissociation is used. Lilas Al Loulou, a Syrian refugee and BCB student, then spoke about fear, a theme brought up earlier. She expanded on this, stating that while the host country may have fears of opening its borders to a large amount of people, we ought to consider who is on the other side as well. Immigrants are filled with anxiety, doubts, and apprehensions of their own. This brings me to another aspect taken up, which is that it is common to talk about refugees and much less common to talk to them. The ones present in the room themselves said nobody ever asks them what they really need. This discussion reminded me of one of definitions in the 6 Degrees dictionary, which was available on the television screens and postcards being handed out and which guided me throughout the day. The term refugee was defined as: 1) One who escapes despair, walks across the Sahara, is abused, raped, beaten, used as slave labour, and finally risks their life on a boat only to be categorized by Europeans as economic migrants. A form of persecution. 2) You don’t want to be one. 3) Requires courage. Finally, also during What’s Next, a comment made by a fellow Brazilian reminded me of my own cultural space. He told us how his mom acts Islamophobic because she is misinformed or uneducated on the subject. He said that, as far as he knows, she has never even met a Muslim person in her life. This applies to some acquaintances I have back in Rio, too. Many Brazilians find it easier to generalize and believe every Muslim is a terrorist rather than educate themselves on this topic. Given that the recent refugee crisis is so distant from South America and people’s daily lives there, many don’t see the need to actually try to understand the situation better. So this guy said (in a very funny way, I must add) that when he finally returns to Brazil after three years this December, having learned more about forced migration in a country of immigration like Germany, he is going to ruin Christmas. By the end, discussions had taken much longer than expected as time flew and more than half the auditorium had their hands up wanting to contribute and share their point of view. It made things hard for the moderator who tried to tie together the abundant ideas. I guess what’s left for those who didn’t get a chance to speak or attend this time is to continue the conversation with friends, family, professors at BCB, whenever and wherever possible. We don’t need to wait for conferences to discuss these issues, and we can’t afford to do it either. So, keep talking and bring even more insights to 6 Degrees Toronto, or to the next edition here in Berlin in 2019. This is an excellent recap of the day, and a great reminder of the breadth and depth of the conversations we had at 6 Degrees Berlin. The issues are complex and urgent, but I hope it will also positively impact your studies at Bard College Berlin Daniela! Thanks for joining us, and we’ll see you at 6 Degrees Berlin 2019.